Cölbe/ Germany, December 2010. The German solar energy enterprise, Wagner & Co, has been named one of the country’s three most sustainable brands. The award is made annually by the German sustainability council to companies and people who are role models in sustainable action. Wagner & Co shared the accolade with LichtBlick, a clean energy provider, and alverde, a natural cosmetics producer. 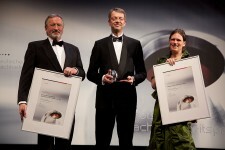 The prizes were awarded on 26 November 2010 in Düsseldorf’s Hotel Maritim. The award for the most sustainable German brand went to LichtBlick, one of four energy providers in Germany who entirely focus on renewable energy based power production. “We congratulate LichtBlick and share their joy because we both want the energy supply system to be made totally renewable as soon as possible,” Ms Altmann said. Wagner & Co has adhered to a sustainability philosophy for more than 30 years. Ecological, economic and social sustainability were the drivers for launching the business in 1979 and remain the pillars of the company culture. Solar systems developed by Wagner & Co serve sustainability on office and factory buildings. Already in 1998 Wagner & Co set a standard with Europe’s first passive energy office building. In 2008 the energy self-sufficient collector factory began production. It is completely green-powered, producing more energy than it uses from renewable sources. Wagner & Co consistently also opts for 100% clean electricity in other company buildings. Recently EWS, a citizen owned renewable energy based power provider, became the company’s power supplier and LichtBlick the gas supplier. Now all externally purchased energy underscores the corporation’s low ecological foodprint. Energy optimization and state-of-the-art, scientifically guided energy management permeate all levels and activities of the enterprise – from the production lines to the external power supply and to internal office organisation. For more than 30 years the solar pioneer has printed and copied on paper recycled 100% from old paper (Ciclesilk Premium White by IGEPA, RecyStar Polar by Papyrus and Cyclus Print by Europapier). Using old paper spares forests, cuts energy and water consumption by two thirds and reduces the environmental burden of paper production. Sustainability and aesthetics are twinned because recycled papers are just as white. Wagner & Co also focuses on social sustainability. For example, in summer 2010 the company backed the project of two high school students from Marburg who hitchhiked around the Baltic Sea collecting donations for the Baphumelele Children’s Home near Cape Town. Wagner & Co supported the project and fitted a solar system on the home’s roof that provides hot water for the children. Nowadays this kind of engagement is called corporate social responsibility – but personal commitment of the enterprise and the people in it to make life a little more liveable for others remains at the core – where it has been for 30 years. This sustainability practised throughout the enterprise was rewarded in 2005 with the renowned German Solar Prize of the German Section of the International Solar Energy Society (DGS) and Eurosolar in the enterprise category. Numerous other prestigious prizes and distinctions followed. Wagner & Co is a solar technology pioneer whose philosophy is living sustainability linked with quality and social responsibility.